Rachel Carson Council President and CEO, Dr. Bob Musil, was in the Bay Area in California for the West Coast launch of his book, Rachel Carson and Her Sisters and to speak to environmental audiences at the University of California, Berkeley, St. Mary’s College of California, and to some 700 environmental historians at the annual conference of the American Society of Environmental Historians (ASEH). Musil spoke at the opening reception of the ASEH conference dedicated to Rachel Carson and in memory of the 50th anniversary of her 1964 death from breast cancer. Five lucky ASEH members won copies of Rachel Carson and Her Sisters that were raffled off before Musil signed copies sold at the conference. Rachel Carson’s only trip to California was to the Bay Area in October 1963 for a major speech and a look at Muir Woods with the Sierra Club’s David Brower. 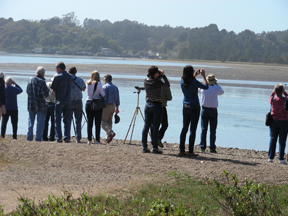 Dr. Musil and other ASEH members recalled Rachel and Silent Spring as they birded around the Bolinas Lagoon and Stinson Beach. 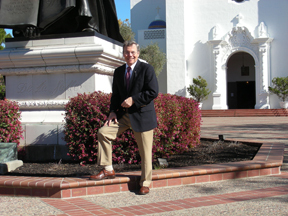 Musil’s luncheon speech at St. Mary’s College of California in Moraga, CA was his third time invited as a key speaker to the LaSallian Christian Brothers liberal arts college. St. Mary’s, with its beautiful Spanish mission architecture, is nestled amongst foothills and redwoods northeast of San Francisco. Musil was welcomed by Dean Stephen Woolpert, of the College of Liberal Arts, a strong environmentalist who leads sustainability efforts with a campus sustainability committee and signed up St. Mary’s College for the growing network of Rachel Carson Campuses.